SKU: 80B 500 Series EQ. The Series 80B 500 Series EQ incorporates a classic four band equaliser which is identical to that employed in the Trident Series 80 console. It consists of frequency switchable high and low pass shelving sections, coupled with two swept low and high mid range bands and a switchable 50Hz, 12dB per octave filter. Both swept midranges have been carefully chosen for maximum effect on music programme and a good degree of overlap is provided. Download the 500 Series 80B EQ manual here. Begin with all boost/cut controls – those with centre detents, set to their mid way (‘0’) positions. Adjust the low and high mid frequency sweep controls to their minimum positions (fully anticlockwise). The50Hz high pass ‘Filter‘ switch should be in the out position. Set the frequency select switches controlling the high and low shelving sections, to 120Hz and 12kHz respectively. Lastly, set the ‘EQ’ switch to the ‘in’ position (the associated LED will illuminate). Rotation of the high frequency shelving control in a clockwise direction emphasises high frequencies, while turning the control in an anti-clockwise direction from centre attenuates high frequencies. a subtle change of emphasis on the affected low frequencies by altering the shelving point from 120Hz down to 60Hz. The ‘low mid’ and ‘high mid’ equaliser sections are peaking filters. Adjustment of their parameters is achieved by use of the boost/cut knob and its associated frequency sweep knob. Boost or cut of a given frequency is performed by moving that control from its centre detent position: clockwise for boost, anti-clockwise to cut. The frequency to be boosted or cut is selected by the frequency sweep control knob. The range of frequencies of the ‘low mid’ control extends from 100Hz up to 1.5kHz. For the ‘high mid’ sweep, the frequency range begins at 1kHz (overlapping with the low mid section) and continues up to 15kHz. 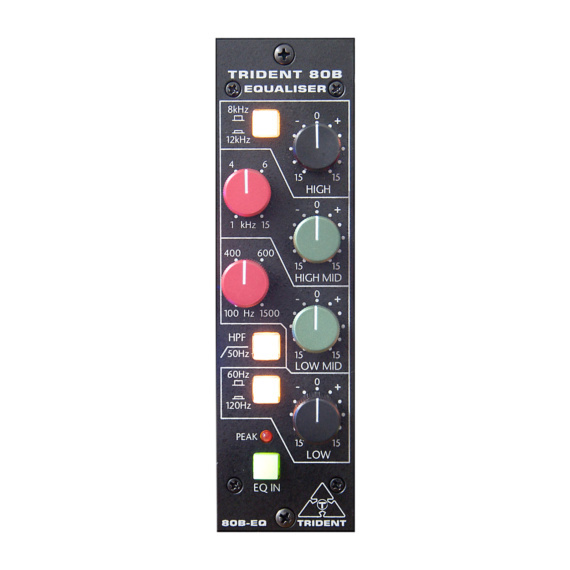 The Series 80B 500 Series EQ incorporates a classic four band equaliser which is identicalto that employed in the Trident Series 80 console. 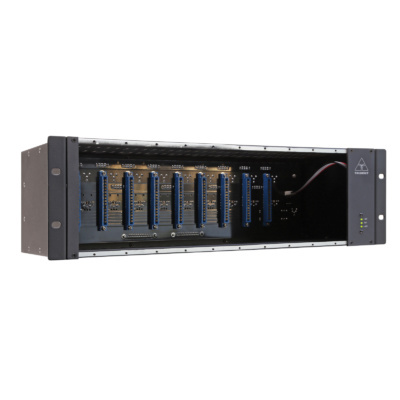 It consists of frequency switchable high and low pass shelving sections, coupled with two swept low and high mid range bands and a switchable 50Hz, 12dB per octave filter. Both swept midranges have been carefully chosen for maximum effect on music programme and a good degree of overlap is provided. Finally, selecting the ‘Filter’ switch introduces a smooth, 50Hz, 12dB/octave roll-off to effectively eliminate ‘rumble’ caused by, among other things, someone’s feet moving about near a microphone stand, nearby traffic noise and AC systems. The amount of boost (accentuation) or cut (attenuation) that is applied to the audio signal is entirely dependent on the programme content and it is not our intention to advise on this. Application of equalisation is a very subjective matter and is best learned by experiment. The equaliser bypass switch ‘EQ’ is a useful facility for comparing the signal before and after the application of equalization. The Series 80B-500EQ is derived from the legendary Series 80B Consoles designed by Trident Audio Developments in the late 1970’s. It incorporates an exact replica of the equalizer design that gave the original console its unique sound. These consoles have been used to record just about every major artist in the past three decades, including Elton John, Dire Straits, David Bowie, Rod Stewart and Stevie Wonder to name but a few. More recently they have been used to record artists such as Radiohead and Pavarotti. 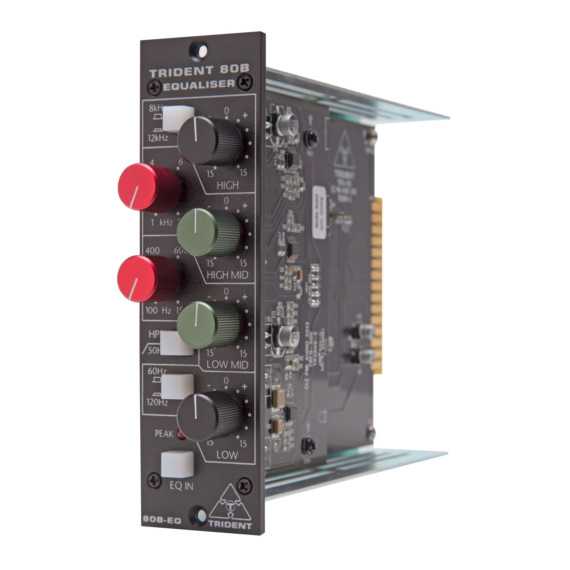 The Trident Audio Developments Series 80B-500EQ unit brings with it a historic pedigree and is offered at a price that is now affordable to all studios and home recordists. The sound and the circuitry of the consoles used to record countless hit records. In the late ’70s Trident Audio developed a new series of recording consoles to update Trident’s sound for a new generation of musical talent. The result was the Trident Series 80, the sound of which quickly became a favorite among the top artists. The Series 80B doesn’t just capture the sound of these legendary consoles, it is the exact same painstakingly re-created circuitry. The Series 80B iconic 4-band equalizer lets you tune your sound to perfection. The Series 80B-500EQ is one of Trident’s most sought after 4-band equalizers. Loaded with frequency-switchable high and low shelving sections, as well as sweepable low-mid and high-mid bands and a switchable 50Hz, 12dB per octave filter, the Series 80B gives you an exceptional degree of control over your sound. The Series 80B’s highly resonant Q peaks are particularly favored by many top engineers for tuning instrument tones.